It was the late 1970s and Washington Water Power’s crystal ball suggested that the company should beef up its energy portfolio with renewable sources beyond hydropower. Meanwhile Pacific Northwest lumber mills knew that the Clean Air Act was about to shut down those familiar teepee burners because of tighter air quality regulations. From there, timber industry officials and power providers shook hands on a deal, kicking off the Kettle Falls, Wash., wood waste power plant on October 13, 1983. The ambitious project marked a first in the West. As Washington Water Power, now Avista, celebrated its 125th anniversary recently, the company aired a series of television commercials on its historic milestones. Predictably, Kettle Falls was touted as a major accomplishment. The biomass utilization project is also documented on Avista’s anniversary website www.avistalegacy.com with the segment on Kettle Falls providing valuable context for today’s emerging woody biomass energy projects. Following is an excerpt. No doubt the Kettle Falls plant statistics and background have helped other startups make headway as they’ve come online using woody biomass fuel stock. The biggest issue that frequently stalls woody biomass power output is of course finding consistent fuel supply. In the early days of Kettle Falls, the challenge wasn’t as apparent as it is today because timber harvesting was at a more brisk pace, plus there weren’t as many entities vying for woody biomass. Times changed considerably with the spotted owl chapters, as well as with clean air regulation upgrades. One thing the Kettle Falls plant has provided, however, is a continuing example of what can be done with woody biomass power. Clearly Avista feels proud of its pioneering work with biomass power, and the timber industry has been able to point to a long-standing success story. Woody biomass projects in the West are moving ahead these days, although opposition still exists. One recent study focused on a rural site in Nevada County, California, in the vicinity of Grass Valley. The proposal is for a three-megawatt biomass gasification plant, with the roadblocks immediately identified as: supplying the amount of available biomass on a sustainable basis; identifying the type of system best suited to the biomass available; locating the most feasible site for such a plant; and calculating the realistic economic expectations of running such a project. Local loggers watching the project’s progress seem most concerned with transportation aspects, and most agree that conversion to trailers with walking floors would require costly upgrades for them. For the community surrounding such a plant, the big concern seems to be increased truck traffic, while the positive aspects are a decrease in wildfire danger and better utilization of wood wastes. There’s nothing new here, because all woody biomass projects face the same obstacles. Taking things in a different direction, University of Idaho researchers are evaluating smaller scale projects, and Extension Forestry Specialist Randy Brooks is investigating producing wood pellets. His graduate students are tasked with analyzing pellet density, ash content, and BTUs by conifer species. Brooks has procured a small pellet mill from a New England-based outfit called Make Your Own Pellets (www.makeyourownpellets.com) and will be presenting some of his findings at the upcoming Small Log Conference being held in Coeur d’Alene, Idaho, March 24 and 25, 2015. See www.forestbusinessnetwork.com for all the details; the conference will have several woody biomass presentations, plus a pre-conference field trip on March 24. The smaller scale pellet production is a unique focus, perhaps giving more regional opportunities to entrepreneurial types living in areas with just enough woody biomass to facilitate limited production. The idea seems similar to producing animal bedding and mulch, although making pellets requires many more steps. Brooks has said moisture content of wood wastes being considered for pellet production must have a 15 percent moisture range or the pellets won’t compact. Learning about such aspects through research can move any small-scale pellet manufacturer much closer to devising a successful business operation, so the university link is quite valuable. 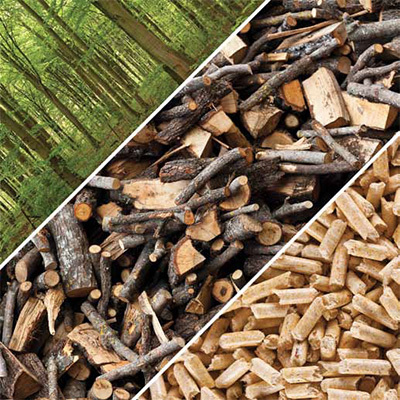 For those wanting to know more about woody biomass possibilities, the Small Log Conference will be covering a whole range of biofuel/biomass options, including biochar; biojet fuel from logging slash; utilizing forest residues for the production of bioenergy and bioproducts; and converting beetle-killed trees into biofuel. 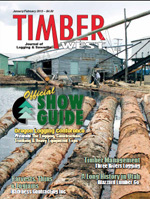 Clearly the timber industry isn’t standing still when it comes to using logs and wood waste in an optimum fashion.